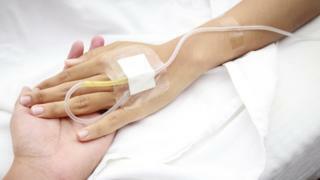 The decision to reduce chemotherapy doses for NHS Tayside breast cancer patients lacked "challenge or consultation", a report has concluded. NHS Tayside lowered dosages to 304 patients, 14 of whom later died, from December 2016 to reduce side effects. The Immediate Review Group (IRG) said there was increased risk of recurrence for one patient per year as a result. NHS Tayside said it "fully accepted" the findings of the report. The health board said it had brought its breast cancer chemotherapy doses back in line with other Scottish health boards. Chief Medical Officer Dr Catherine Calderwood said that while the report concluded that the risk was "very small", she "absolutely" recognised the concerns of current and former patients. She said: "NHS Tayside has been in contact with all patients affected to offer them an appointment with an oncologist. "All but 13 of those who want to take up the offer of an appointment have already been booked in and the board is waiting to hear back from the 13 outstanding patients." The Health Improvement Scotland watchdog found previously that from December 2016 onwards, the dosage given to breast cancer patients was lower than in any other Scottish health board area. The new IRG report said: "Whilst the decision to reduce doses in 2016 was taken in the best interests of patients, and based on an audit of toxicity, this decision lacked robust challenge or consultation. "It reflected a unilateral internal decision to adopt practice which was judged by the IRG as being outwith best current practice, and close to being unacceptable." NHS Tayside's acting medical director Prof Peter Stonebridge said: "Patients and their families should be assured that we are taking this issue extremely seriously and putting in place all the necessary changes to ensure we provide a high-quality breast cancer service in Tayside."